This week sees the release of the remake of Poltergeist hitting theaters, so now is as good a time as any to reflect back on the 1982 horror classic that inspired it. However, if you have nothing but positive memories about the movie, you may want to turn away now, as this video is going to tear it a new one. CinemaSins has launched the latest episode of its "Everything Wrong With..." series, and this time around they've taken aim at what many consider to be one of the greatest paranormal activity films ever made. 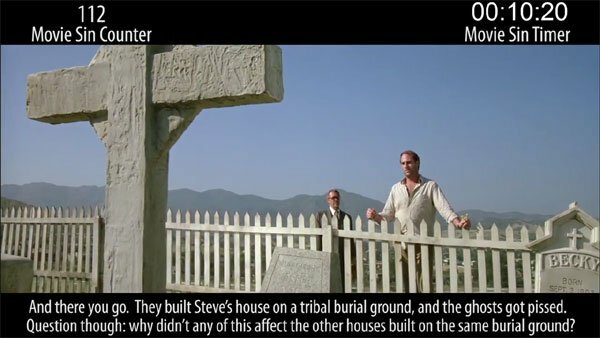 There is a point in the video where the narrator admits that Poltergeist really is a fantastic movie, and actually knocks five points off the final sin score as a result, but everything before and after really does point out a lot of big problems in both the narrative and the construction of the film. So what are the central issues of the Tobe Hooper/Steven Spielberg film? Well, the approach to the paranormal activity in the movie is certainly a one. For example, it seems like the spirits in the story do enjoy really screwing with the inhabitants of the house, but why exactly has it taken so long for them to start acting up? There are also some pretty strange inconsistencies in the degrees of their behavior, from stacking chairs and creating slip n' slides to face-ripping hallucinations. Furthermore, it's never really made clear why the Freeling family seems to be the only family being affected by the ghosts, considering it's clearly said that their house is not the only one built on a burial ground. As the video points out, though, there is a weird ace up Poltergeist's sleeve that can be used to really explain away any of the movie's many notable weird continuity mistakes or character actions: the ghosts are responsible. How did that Darth Vader poster get back up on the wall? Ghosts did it. Why did Carol Anne's entire family abandon her during all the weirdness? Ghosts did it. Why does a bottle of 409 turn into a bottle of Fantastik? Ghosts did it. For all its issues, however, Poltergeist is still a terrific film, and the upcoming remake directed by Gil Kenan most definitely stands in a large shadow. We'll have a review of the new movie up for you later in the week, and we'll see if perhaps the new version can fix some of the original's issues.